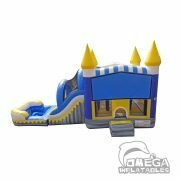 Our Blue Knights Castle Combo is sure to keep all the little ones entertained. make it a waterslide for only $50 more. Add a themed banner for $50 more Avengers, Cars, Spiderman and disney princesses.